NAWCO’s new Nutrition Wound Care Certified™ (NWCC) credential will give you more than just a few more letters after your name. 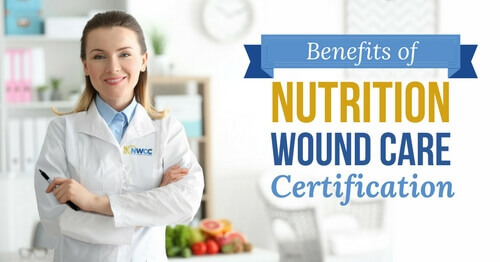 By completing the approved wound care certification course through Wound Care Education Institute® (WCEI®), you’ll also receive the latest nutrition information to help you improve the healing and lives of your patients. And if you are looking to advance your career, wound care training and certification provide the clinical knowledge to help others see you as the expert in the area of nutrition as it relates to wound healing. Yes, both you and your patients will benefit from this certification. This nutrition certification program will benefit you, your patients, your wound care team, and your facility. Becoming a more valuable wound care nutrition expert has many benefits for your professional development and patient outcomes. Certification also lends credibility if you ever are involved in a lawsuit, and as you know, wound lawsuits are plentiful. NWCC certification confirms your nutrition knowledge, skills, and abilities in wound care, based on predetermined standards. When facilities are looking to hire or promote, education is an important determining factor, which is why certification in your field is important. Certification recognizes your commitment to keeping current with the latest information, developments, and research to improve your professional abilities and clinical judgment. To learn more about the Wound Care Education Institute’s NWCC course for dietitians, click here. Join this group of certified wound care nutrition professionals and make a difference in your career and your patients’ lives. Get started on earning your NWCC designation today! Shadix CK, Bell-Wilson JA. Finding your niche—certification options for the RD. Today’s Dietitian website. Today’s Dietitian. 2007;9(3):40. http://www.todaysdietitian.com/newarchives/tdmar2007pg40.shtml. Accessed January 29, 2018. Wound Care Education Institute® provides online and onsite courses in Skin, Wound, Diabetic and Ostomy Management. Eligible clinicians may sit for the prestigious WCC®, DWC®, OMS, and NWCC™ national board certification exams through the National Alliance of Wound Care and Ostomy®(NAWCO®). For details, see wcei.net. This entry was posted on Friday, February 9th, 2018 at 11:27 pm	and is filed under Education, Nutrition, Wound Care. You can follow any responses to this entry through the RSS 2.0 feed. Both comments and pings are currently closed.